Republican Convention Theme: We Lie! The Republican National Convention was held this week and although I didn’t watch it live, I did read the speeches and reactions to them and one thing jumped out at me. Republicans were serial liars. These weren’t just political misstatements or hyperbole but out right LIES. What does it say about our political system when people don’t seem to be concerned that serial liars want to be in charge of our government? 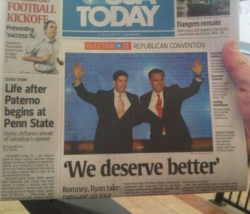 This entry was posted in History, Life, Media, Politics and tagged 2012 US Presidential Election, convention, GOP Fail, liars, lies, Mitt Romney, Paul Ryan, Republican National Convention, truth on August 31, 2012 by Doug. Some kind of convention took place this weekend where a bunch of white men and women complained about the government without using facts and evidence to back up their claims. It was “find a scapegoat” weekend and they found plenty. It all reminded me of the KKK having a convention and sounded like one too. They also failed to admit that their political ideas screwed us all when they were in charge. Speaking of the straw poll, Ron Paul won it. Seriously. Ron Paul crushed–absolutely crushed–all the other GOP big shots on the list except for Mitt Romney, who took a close second. Romney has a history of doing GOTV on big straw polls, but apparently he didn’t get an operation in gear to best Paul. Paul’s victory said something about the event, and the type of people who attended it. CPAC was an exposition of ideology and conservative glee, not necessarily political prowess. Ron Paul will probably not be president in 2012; he seems to have no relationship with the tea partiers; he has ceded his conservative stardom to the likes of Sarah Palin. So it’s questionable how much CPAC has to do with electoral reality–and even the realities of the conservative movement’s preferences. The plea was made all the more effective by the intertwining of [Glenn] Beck’s own story of struggle and redemption Pointing to his time as a recovering alcoholic, the Fox News host urged the GOP to embark on a 12-step program of recovery. “Hello, my name is the Republican Party, and I got a problem. I’m addicted to spending and big government,” he declared, reading out the apology he wanted lawmakers to deliver. Reflecting on his own lack of formal education, he railed against government handouts – extending the logic to argue against a right to health care. The crowd was enthralled, even as Beck took them down winding tales of Calvin Coolidge, the Statute of Liberty and the supposed great middle class explosion of the 1920s. That is what drives me nuts. Whack jobs like Beck and the other speakers will never admit that the previous 8 years, when they had their way under Bush, screwed us all. They still drink from the Kool-aid that small government and handouts to the rich works and millions of unemployed people with no homes show that it doesn’t. The GOP in general believe that spending on war is good but spending to help people live is bad. This entry was posted in Culture, Media, Politics and tagged convention, CPAC, Glenn Greenwald, GOP, Republicans, Washington DC on February 21, 2010 by Doug.